Properties in Melody Key average 4.8 out of 5 stars. Property 1: Paradise Found... a Reel and Diver Retreat! 3/2 on the Water in Paradise Monthly Rental 28 Day min. Property 2: 3/2 on the Water in Paradise Monthly Rental 28 Day min. Property 4: Four bedroom ocean-front home with pool, spa, boat lift and luxury living! Property 11: Venture Out - Waterfront Paradise 2/1, with 35' Dock and open water views! Property 24: Oceanfront Million $$ View. MAGNIFICENT OCEAN VIEW w/35' of DOCKAGE!! Many activities. Great Rates for 2019! Property 26: MAGNIFICENT OCEAN VIEW w/35' of DOCKAGE!! Many activities. Great Rates for 2019! Property 29: Paradise and the Florida Keys are Waiting for You! 2020 ALREADY BOOKING! PALM TREE PARADISE AT VENTURE OUT + 6 BIKES, 2 KAYAKS, OUTDOOR PATIO*GREAT DEAL! Property 33: PALM TREE PARADISE AT VENTURE OUT + 6 BIKES, 2 KAYAKS, OUTDOOR PATIO*GREAT DEAL! Cottage with Pool, Kayaks, and Boat Dockage just minutes to Key West! Property 34: Cottage with Pool, Kayaks, and Boat Dockage just minutes to Key West! Private Oceanfront Cottage with dockage, pool just minutes to Key West! Property 37: Private Oceanfront Cottage with dockage, pool just minutes to Key West! 2/2 Canal Front Home Big Pine Key. Easy ocean and gulf access! Property 38: 2/2 Canal Front Home Big Pine Key. Easy ocean and gulf access! Water Front, Private Boat Dockage, Heated Private Pool, Minutes From Key West. Property 40: Water Front, Private Boat Dockage, Heated Private Pool, Minutes From Key West. 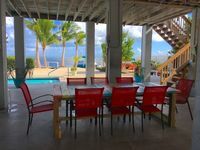 Property 44: Paradise in the Lower Keys! Great property, very clean. We enjoyed our stay in Cudjoe, Mitch made sure we were welcomed and taken care of. The location can&rsquo;t be beat with being close enough to Key West with the ability to get away from it and relax. This property offers the ability to not leave from boating, swimming, fishing and other vacation activity. We will be back for sure.